Coodes Solicitors’ Residential Property team has won six awards for its excellent service to clients who are buying or selling their homes. 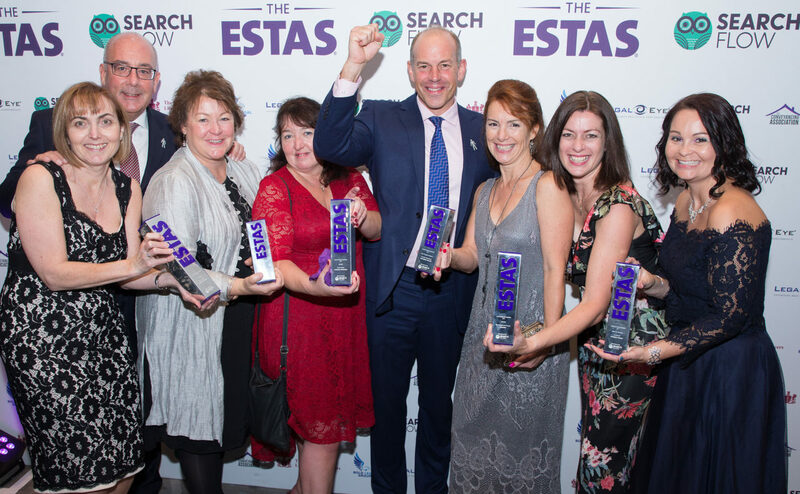 The South West law firm was crowned best in the South West and was presented with the six trophies by TV property expert Phil Spencer at the new ESTAS Conveyancer Awards in London. Coodes Solicitors won all three Regional South West awards. The firm’s Truro office won the Gold South West award, while the Newquay office won the Silver South West award and the St Austell office was presented with the Bronze South West award. Coodes’ Truro office was named Best in County and the firm was presented with the Silver award for Best Regional Group. Johanna Heane, who is based in Coodes’ Newquay office was presented with one of three nationwide People Awards for her exceptional customer service ratings, after being one of only ten individuals from across the UK to be shortlisted. The ESTAS Group selects the winners based purely on feedback data from customers, who were asked a series of questions about the service they received during the home moving process. The winners were announced at the first ESTAS Conveyancer Awards sponsored by SearchFlow on Friday 20th October. The awards were held in the ballroom at the prestigious Grosvenor House Hotel in Mayfair London. The ESTAS have been running since 2003 but this was the first awards event purely for conveyancers, and the event was backed by the Conveyancing Association and The Society of Licensed Conveyancers. Alistair Whyte, Partner and Head of Residential Property at Coodes Solicitors, said: “Congratulations to our Residential Property team on this absolutely fantastic achievement. Just being shortlisted for The ESTAS, alongside some of the UK’s biggest conveyancing firms, was a great result and we would have been proud to have won one award! Coming home to Cornwall with six trophies – including being named best in the South West – is amazing. Particular congratulations go to Johanna Heane for being named one of the best three conveyancers in the country. With a network of offices across Cornwall and Devon, Coodes Solicitors has been expanding and investing in its Residential Property team. In September Coodes was Highly Commended in the Regional Firm – South and South West – category of the LFS Conveyancing Awards 2017.